Like other property management companies, Pro-Managed collects a security deposit from tenants when they move into one of our properties. A security deposit is collected to ensure that rent will be paid and other responsibilities of the lease performed. When the lease ends, the landlord may use the deposit to pay for repairs or professional cleaning. When the lease ends, the security deposit may be used to pay for repairs or professional cleaning. 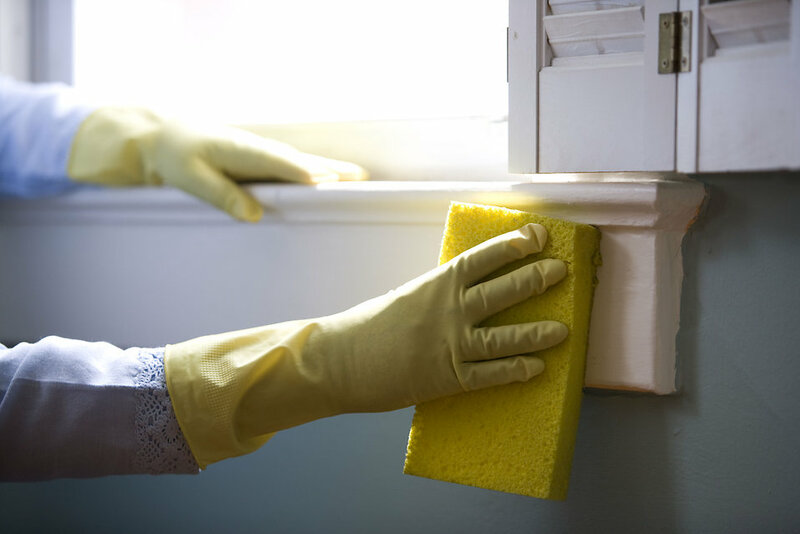 Often times, tenants forget, or simply don’t bother, to clean the property well enough to get all of their security deposit back. Below are the top 10 things we find that tenants skip over most often. Use this list to help ensure you don’t miss cleaning anything when moving out of your rental property. While tenants think they’ve cleaned their kitchen, most have skipped over cleaning some of the dirtiest areas in the room. For example, kitchen appliances such as stoves, ovens, refrigerators, dishwashers and microwaves often go uncleaned. Be sure to clean them all inside and out. You can run your dishwasher empty with special dishwasher cleaner in it for a deep clean. Ovens also have a cleaning cycle that can be run to remove burnt on foods from inside. Defrost your refrigerator and freezer and remove all food from inside so that all inside surfaces can be properly cleaned as well as the outside. Kitchen and bathroom cabinets tend to get incredibly dirty and often go unnoticed by tenants. Kitchen cabinets accumulate a ton of grease from cooking as well as dust and fingerprint buildup. Bathroom cabinets get dusty too and are prone to soap scum buildup and other gross bathroom crud. Wiping down cabinets with cleaner and a rag is easy to do and can help you recoup some of your security deposit. Sometimes tenants are so focused on cleaning up the inside of their rental property that they forget to make sure everything is in tip-top shape outside. Be sure that your outdoor spaces are clear of trash and any other debris such as weeds, fallen tree limbs, and animal waste. Not many people think about wiping down walls and trim, but they can be a huge source of dust build up and fingerprint smudges. Also, cleaning your walls will help you distinguish between what’s dirt and what are actual flaws that may need to be patched and repaired. Nobody likes cleaning bathrooms. That’s why we find that this tends to be the most disgusting room we come across when doing a move-out walkthrough. Taking the time to properly clean your bathrooms with bleach cleaner will save you money in the long run as its a costly deduction from your security deposit if not done properly. Most people don’t think about ceiling fans when cleaning their homes, let alone a rental property. Whether their left on or off, ceiling fans accumulate a tremendous amount of dust. They can be easily cleaned with a rag and some all-purpose cleaner. Just be sure to stand on an appropriate step ladder to reach the fan blades, and of course, remember to turn the fan off first. While many tenants do in fact clean the window glass prior to moving out, they often forget to clean out the window tracks. This then leads to a deduction from their security deposit. Some all-purpose cleaner, a few rags, and even a small scrub brush help make this task a breeze. While you’re cleaning your windows, do a once-over cleaning on your window blinds as well. They tend to collect a lot of dust and be cleaned up pretty quickly with some cleaner and a rag. Vacuuming carpets is a must for sure, but if your carpets are particularly dirty or stained, a shampooing may be in order. A carpet shampooer can be rented from most rental stores or you can hire a carpet cleaning company to do the job. Either way, be sure to save your receipts if you do either one as proof that the job has been done. Light fixtures gather tons of dust, cobwebs, and bugs. Use a proper step ladder to reach your light fixtures and clean them with a rag and some all-purpose cleaner.